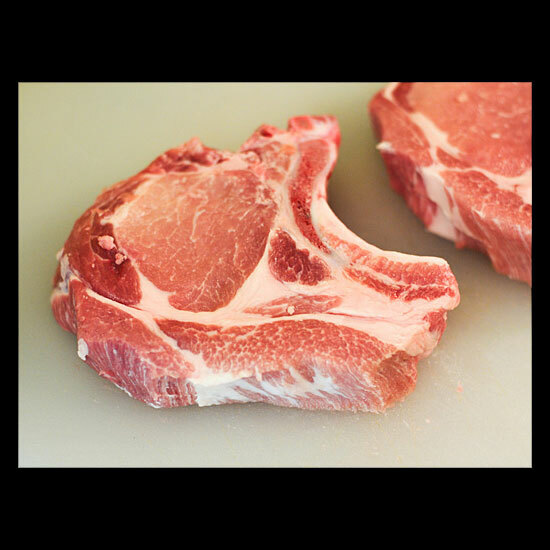 The Cut: End-cut rib pork chops, as the name implies, are taken from the front end of the rib cage nearest to the animal’s shoulder. Their technical designation in the bible of the meat business, the National Association of Meat Producers guide, is #1410A rib chops. The Sell: For most of my life, I had a conflicted relationship with pork chops. I loved their golden crescent edges, sickles of the purest and densest pork fat. I loved to gnaw on the bone, too, both for its rugged, toothsome gifts and also for the self-parodic aspects—comic props in the Josh Ozersky Show. However, in between the bone and that rim of lard, I generally found a featureless plain of dry and tasteless meat, a “food desert” if ever there was one. One day I found some pork chops that had another layer of meat on top of the first; where the chop should have ended was a second thick slab of muscle that was better than the first. I couldn’t understand why this outer piece wasn’t the star of the show. It was like when Hendrix opened for The Monkees. I would later find out that this was none other than the porcine version of the deckle, that precious and obsessed over cap that sits atop rib eye beef steaks. (Rib steaks and rib chops are the same thing, but from different animals.) But whereas serious beef eaters have gotten the memo, pork enthusiasts have not. That ends here. The spinalis muscle’s unique combination of richness, tenderness and firmness outclasses any other muscle by an order of magnitude. And as a bonus, a kind of insider reward, the rhomboideus muscle comes on the bottom of the end cut. Top that, center loin pork chop! The How-To: Pork chops, unless double cut, rarely achieve that ideal, robust, sizzling browning from a pan or grill. They overcook too fast; the surface buckles against the pan; open flames get one side but not the precious edge; and other misfortunes follow. So predictably, I think they should be fried.